This isn’t my first time raving about Fresh Direct and I am sure it won’t be my last! 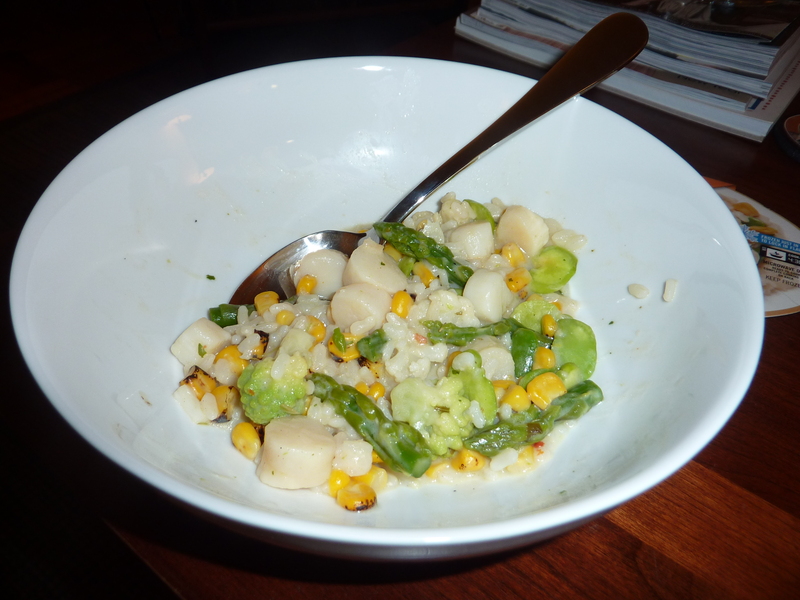 This time I’m impressed by one of their frozen meals, Bay Scallop and Vegetable Risotto. Fresh Direct is known for their freshly made 4-minute meals but this kind arrives frozen and can be stashed away for the next time you’re desperately in need of a delivery alternative! I should be honest, the photo above only shows about 2/3 of the meal – after scarfing the first portion I realized it was fantastic enough for a photo and forced myself to pause. For my taste it is the perfect proportion of vegetables, scallops and rice. Best of all it has a great mix of fresh vegetables – fire-roasted corn, asparagus, fava beans & Romanesco cauliflower – that balance out the richness of the risotto and give a good variety of textures. At $7.99 they are a treat and a great alternative for times when you would otherwise have really splurged! This entry was posted in Culinary Adventures and tagged Easy Dinner, Fresh Direct, Risotto. Bookmark the permalink.